quiet beauty of an undisturbed landscape into the perfect holiday Christmas card. the day. The undisturbed virgin snow brings a calm quiet peace to each winter scene. 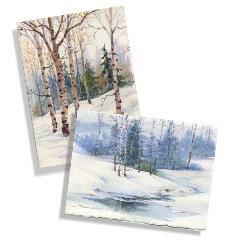 This set of Susie Shorts watercolor winter landscape card paintings features many aspects of painting snow. Snow covered trees, rocks and grasses creates a winter wonderland card for winter holiday occasions.